Contact and sparring are crucial aspects of learning martial arts. While this can seem intimidating, it’s important to understand that this is a valuable lesson. Only light contact is permitted in the studio, to prevent serious injury. It also helps further your training, in that it can help you learn to avoid serious injury. Be sure to check with your studio on their contact and sparring policies prior to enrolling in your class http://www.minrec.org/wilson/pdfs/Kids%20Karate%20-%20%20Sparring.pdf. 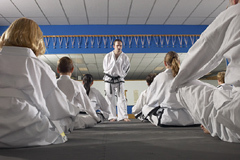 Contact and sparring can be a frightening thought for many parents who sign their children up for martial arts classes. It’s important to understand that children can learn valuable lessons from the light contact permitted in the studio. Students learn valuable self-defense skills like how to manage pain, to not stop fighting and how to avoid serious injury. Read more at http://www.minrec.org/wilson/pdfs/Kids%20Karate%20-%20%20Sparring.pdf.